Last but hardly least, classic gaming company Nintendo today unveiled its 2015-6 lineup at the E3 gaming expo in Los Angeles. In an hour-long stream hosted by puppet versions of the company’s head honchos, Nintendo revealed a new Star Fox game, shared more info on its coming game-design title Super Mario Maker, introduced a new multiplayer Zelda for the Nintendo 3DS, talked Amiibo action figures and much more. Here are the highlights from Nintendo at this year’s E3. This year, Nintendo kicked off its E3 video presentation with news and footage of an all-new game in the Star Fox franchise. Star Fox Zero puts you in control once again of an Arwing fighter as Fox McCloud (great first name, don’t you think?). A number of different vehicles are available as well, which is important – some secrets can only be discovered by piloting the right one. The game keeps a lot of the Star Fox 64 aesthetic, which may look a bit low-tech to some, but it does feel faithful to the series. And before you ask, yes – you can absolutely do a barrel roll if you want. Slippy, Falco, Peppy and the rest of the Star Fox Zero team are coming to the Wii U sometime this holiday season. One of the more intriguing titles out of Nintendo this year is video game design program Super Mario Maker. It lets you build, play and share your own Super Mario Bros. levels on the Wii U. The options here are endless, because the game lets you switch between 8-bit Super Mario Bros. and Super Mario Bros. 3 assets, 16-bit Super Mario World assets and modern-day New Super Mario Bros. U assets. Not only does the game reward creativity, but it can also help teach kids essential principles of game design, which could be a major asset in a future career in programming. Want to create your own water world or ghost house and share it with the family? You’ll have to wait until September 11, which is when Super Mario Maker is released for the Wii U. You can also demo the game tomorrow (Wednesday, June 16) at a Best Buy near you from 4 to 9 PM local time and score yourself a special pin (while supplies last). Action figure/video game hybrid franchises Skylanders and Amiibo, once competitors, are now coming together in a really cool partnership. Later this year, Nintendo will make available special Turbo Charger Donkey Kong and Hammer Slam Bowser figurines and vehicles that are both Skylanders SuperChargers toys and Amiibos. This means you and the kids will be able to fling red shells as King Koopa and build ladders as DK in this year’s coming Skylanders game. There was no big new Super Mario title announced at E3, but Yoshi’s Woolly World is definitely the next best thing – if not better. The game is the latest in the Yoshi’s Island series, and this time, the dinosaur hero is made entirely out of yarn. In fact, all elements of this world are made of one textile or another. That comes in pretty handy – Yoshi can eat his yarn-based enemies and turn them into yarn balls that can be used to build new platforms. And if the game design isn’t already filled with a maximum dose of cuteness, get this: A plush yarn Yoshi Amiibo will also be made available for use with the game. 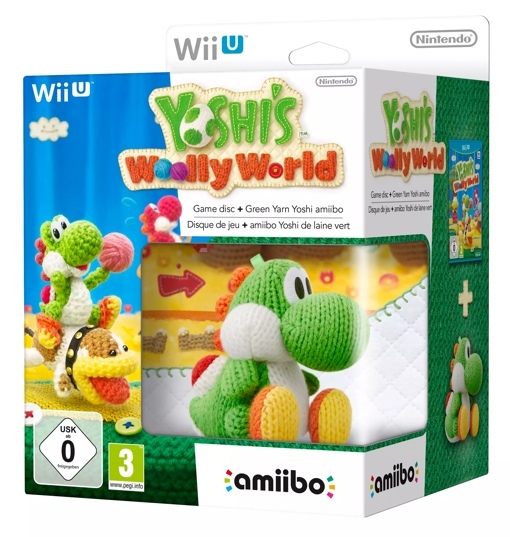 Yoshi’s Woolly World is a Wii U exclusive, and is due for release on October 16. Sadly, there was no Zelda Wii U news from Nintendo at this year’s E3, but the company is introducing a new Zelda title for the hand-held 3DS system this holiday. The Legend of Zelda: Tri-Force Heroes is a multi-player Zelda game in the Four Swords vein, where you can work together with friends online to complete dungeons. This is accomplished, in part, through a totem mechanic, where friends can carry you on their shoulders to help you reach higher places. Or, if you’d rather play solo, you can do so by switching between Links yourself. You can even pick up new outfits in the game to replace Link’s traditional green grab that imbue him with new abilities. The Legend of Zelda: Tri Force Heroes is coming fall 2015 exclusively on the Nintendo 3DS. Last but not least, two of my favorite Nintendo series are being mashed up into one new game. Next year, Mario & Luigi: Paper Jam will bring together the humor-filled world of Paper Mario with the Mario & Luigi role-playing series. It looks like you can expect to see 2D and 3D versions of your favorite Mario heroes side by side, along with twice the Bowser as usual. You even get to pilot your own Papercraft Mario, powered by an army of Toads. Mario & Luigi Paper Jam is coming in 2016 for the Nintendo 3DS system. Want more E3 2015 video games coverage? Be sure to check out the can’t-miss titles announced yesterday by Sony for the PlayStation 4 and by Microsoft for the Xbox One console.